Tri Harder – Part 4, Why do we consider carbon payback? What is carbon payback and why do we consider it? We tend to focus primarily on operational energy and carbon in the property industry forgetting about the carbon associated with the manufacture and installation of building components. The amount of information and awareness of carbon emissions is increasing at a rapid rate. We can now look at operational carbon efficiency techniques and analyse how much carbon it takes to manufacture and install them. In Part 1 of Tri Harder I talked about the different carbon intensities of grid electricity around the world. Australia has one of the worst performing power grids in terms of carbon. In Part 2 of Tri Harder I talked about the difference in the carbon intensity of the electricity grid around Australia. In Part 3 of Tri Harder I talked about the ongoing operational carbon savings of trigeneration in each state. The next question – how long does it take to payback the carbon used in the manufacture and installation of a trigen unit? 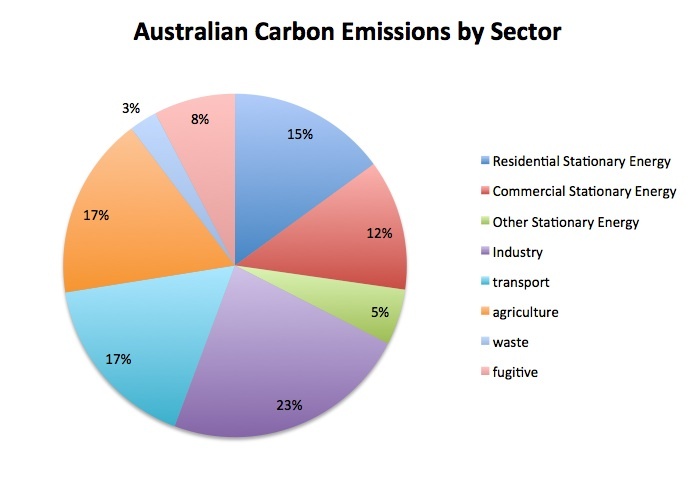 First some background on carbon emissions by sector. In Australia we have carbon emissions from a wide variety of sources – electricity to run buildings, transport, agriculture and manufacturing. The pie chart below shows a typical years worth of carbon emissions by sector. As can be seen the operational energy or carbon used to run our office buildings accounts for approximately 12% of Australia’s total carbon emissions. When we talk about emissions reduction, decarbonising Australia and meeting a Kyoto target we are talking about all emissions not just operational carbon. So if we reduced the carbon emissions from the energy used to run our buildings by 50% but we increase our industrial emissions by 25% we wouldn’t have done anything to our total emissions! So when we get to the point of spending money (embodied carbon emissions in industry sector) to reduced the energy used in our buildings (operational carbon emission in the commercial stationary energy sector) we need to make sure that at some point we will be saving enough money (carbon payback) to payback our investment. Financial payback is pretty much the same as carbon payback. The ultimate goal must be to reduce our total emissions from now on. Using the same large office building as in Part 3 and typical efficiencies of 36% electrical efficiency and 42% thermal efficiency and a two stage absorption chiller we can calculate the how long the it takes to payback the operational carbon. The accurate calculation of embodied carbon should be done on a project by project basis as it varies considerably, if you have to dig more basement volume to house the trigen unit then it will double the embodied carbon, however for the purpose of this exercise I have used the average australian embodied carbon figure of 1kgCO2 per Australian dollar spent. In the charts below I have shown the percentage variance from using trigeneration compared to grid, as can be seen below the additional embodied carbon of the trigeneration unit appears in year 0 (before operation begins) and then reduces year on year from the annual carbon savings of the trigeneration unit. The graph is of cumulative emissions so year 20 includes all the embodied carbon as well as the operational carbon for the whole 20 years. I have also included for a major refurbishment or replacement of the trigeneration engine at year 12, a typical engine life. If the percentage is negative then trigen is better than grid, if its positive its worse than grid. Where the red or green line crosses zero is the year that the embodied carbon is paid back. 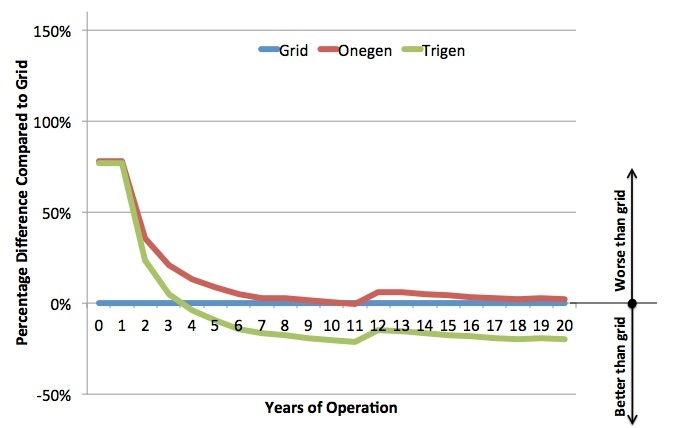 Typical carbon paybacks in Victoria are good, two years for trigen and 2 1/2 years for onegen. 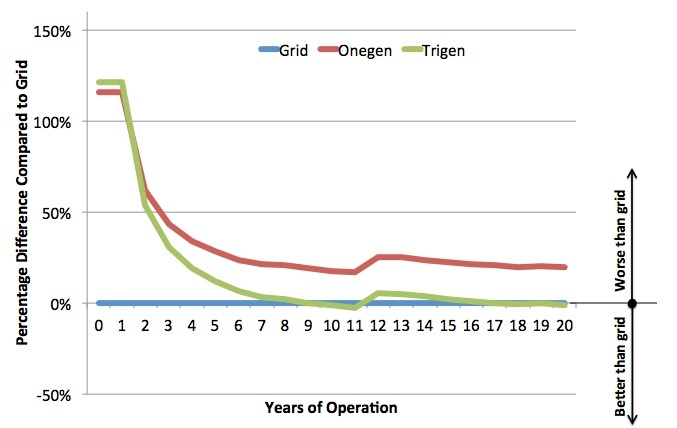 The carbon payback increases, 3 1/2 years for trigen and onegen doesn’t quite get there. It almost does towards the end of its life but then you need to spend more carbon to keep it running. On the border for both trigen and onegen. With a carbon payback of just around 9 years for trigen it maybe that the carbon never gets paid back. And onegen forget about it. Please note that the figures above have maintenance impact included every year in the operational carbon, the simple carbon payback calculations in Part 3 included the maintenance impact at year zero. It also doesn’t include for any ongoing improvement in the grid, if the grid is decarbonised over time then these figures will get worse. I will cover this in my next post. So, as can be seen in the above graphs as we get closer and closer to the realisation that we need to reduce our total emissions and not just our operational emissions the concept of carbon payback will become more and more important. Calculations such as these will become common place in the property industry over the next few years. In summary, in all states apart from TAS there is a operational carbon benefit of using a trigeneration system, but we need to think about total emissions and how long it takes to payback the carbon we invest. We need to calculate the total lifecycle emissions of the technology we put into our buildings. Tri Harder Part 5 – What happens if the carbon intensity of the grid improves? Tri Harder Part 6 – What about flue emissions and maintenance? Tri Harder The Final Chapter – Why do we have so many trigeneration systems going into office buildings and how do I know if trigeneration is right for my building? Hi, love your tri-harder articles. When will part 5 be coming out?